I can honestly say that prior to today, I’d never heard of this phrase but today in the search world it’s everywhere. 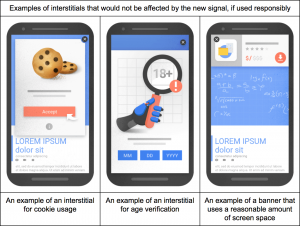 So what does ‘intrusive interstitials’ actually mean? But the quick version is it’s cracking down on annoying pop ups that a lot of sites implement. All in the name of improving the user experience on mobile devices, which is definitely a good thing. I hope they implement something similar for desktop searches. It’s annoying to land on a page and immediately get a pop up asking to sign up to the email news letter, before you’ve even read any of the content and decided whether you do want to know more. 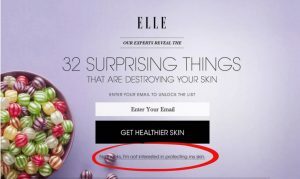 Even worse are the passive aggressive pop ups. I know why sites do this, it increases sign ups but is it really best for the user experience? Personally i’m more likely to sign up for something, after i’ve seen the value in the site.